HD 59686Ab: How Did It Get There? The discovery of numerous new planets has brought with it deeper scientific questions, especially those of planet formation and evolution. How do the lifetimes of stars affect their planets? And what’s more, how do these complicated systems form and stay together? In today’s paper, these questions are tackled for the system HD 59686. This is a binary star system with a circumprimary planet meaning that the planet orbit only the primary star in the system, which is also in a mutual orbit with the secondary star. I like to think of systems like these as Tatooine in a parallel universe: it has the same components as the famous binary star planet, but is rearranged in a different configuration. Figure 1 below shows a more concrete way of picturing the system. 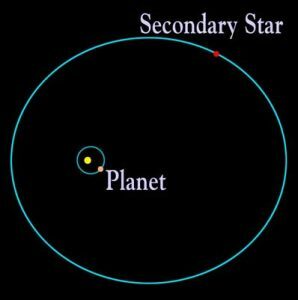 Figure 1: This shows a circmprimary planet -star system. Image from Space Flight Now website. The HD 59686 star system is fairly close (~13 AU) between the two stellar components, and the distance between the primary and the planet is also quite small (~ 1AU). Binary systems allow observers to more closely study the interactions between both stars; in this system, with the addition of the planet HD 59686 A b, the interactions between all the components are much more complicated and intense. How does a planet form and manage to stay formed in such an unusual system? Giant planets within binary systems present a challenging dynamical problem. With the three bodies (HD 59686A, HD 59686B and HD 59686Ab) in motion, the system can experience great tidal forces and faces long-term stability issues. However, despite the odds, HD 59686 seems to be in a fairly stable, if unusual, system. The formation of planets through core-accretion or disk-instability in such close binaries still remains a mystery, but by modeling HD 59686, these researchers hope to uncover important clues about how planets form and remain stable around a star under the strong tidal and gravitational influence of a close stellar companion. The HD 59686 binary system, composed of a 1.92 K star and a 0.53 M dwarf, was observed at Lick Observatory between November 1999 and December 2011. These radial velocity (RV) measurements allowed the researchers to find the velocity of the star along their line of sight. Though the data itself was published in an earlier paper, the authors of this paper focused on determining the system dynamics through computational modeling. The authors created models with several different configurations and found which best matched the data. One of the configurations was for an edge-on view of the system with the planet in prograde, or in the direction of the primary stellar rotation, motion. Another was also an edge-one view but for a planet in retrograde motion, against the primary stellar rotation. The third was for a system mutually inclined along the line of sight for both the planet and stars. The best fits for each of these scenarios is shown in Figure 2. Since the parameters of the primary are well-known this model concentrated on fitting parameters to the planet and the secondary component.The difference between the prograde and retrograde fits is very small. There are some large differences between the model and data in the mutually inclined fit, but the points with these large residuals are fairly sparse. Figure 2: This images shows the three best fits for the different configurations of the HD 59686 system. The blue dots are the RV data points from Lick Observatory. The fit for prograde is shown in blue, in green for retrograde, and in red for a mutually inclined model. 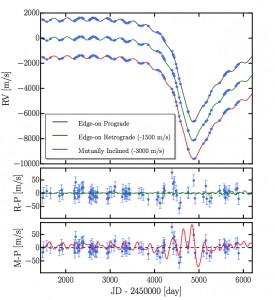 The authors conclude that although the retrograde solution can explain the RV data with great confidence, forming a planet in that alignment is quite unusual and would require further explanation. Prograde motion is more common– however, if the planet was in prograde motion then the data from Lick Observatory could only have been taken when the planet was in a very specific alignment and phase. Planetary dynamics are complicated and so are those of binary stars. In HD 95686, both of these complicated forces and dynamics have somehow formed a unique and observable system. These scientists have developed several models that give us more information about the orbit and how these systems may form. Questions about whether a planet can form in a narrow region in of the eccentric close binary, whether this system requires unusual starting conditions, and whether the planet motion is prograde or retrograde will require more observing and modeling, but already the authors have uncovered important information about HD 59686.